Agatha Mary Clarissa, Lady Mallowan, Order of the British Empire DBE (September 15, 1890 – January 12, 1976), also known as Dame Agatha Christie, was an English crime fiction writer. She also wrote romances under the name Mary Westmacott, but is remembered for her 80 mystery novels, particularly those featuring detectives Hercule Poirot or Jane Marple, which have earned her the sobriquet 'Queen of Crime' and made her one of the most important and innovative writers in the development of the mystery novel. Her appeal is so large that Christie is often cited, by the Guinness Book of World Records and others, as the all-time best-selling writer of fiction, and the best-selling writer of any kind second only to William Shakespeare. An estimated billion copies of her novels have been sold in English, and another billion in 103 other languages. As an example of her broad appeal, she is the all-time best-selling author in France, with over 40 million copies sold in French (as of 2003) versus 22 million for Emile Zola, the nearest contender. She is purportedly outsold only by the Bible. Agatha Christie’s life was at least as colorful as a character from one of her own novels. Her travels with her second husband to the Middle East provided the backdrop for some of her most memorable novels, (Murder on the Orient Express, Death on the Nile.) The first being one of Christie’s own favorites along with The Murder of Roger Ackroyd, (1935) a breakthrough novel for Christie due largely to its unusual plot twist. Christie’s books provide the reader with a window into everyday English life and its ordinary people. In the cloak and dagger setting of country lanes, mysterious fog, and drizzling rain, the reader can suspend moral judgment and be simply entertained by her masterful plot intricacies. Her storytelling weaves a yarn filled with suspense in the classic style of a who-done-it and gives new meaning to the cliched phrase, “as the plot thickens.” Her cliffhanger endings leave the reader stunned. 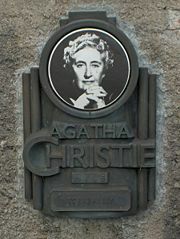 A plaque from the Agatha Christie Mile at Torre Abbey in Torquay. Agatha (Miller) Christie was born in the town of Torquay, along the Devon coast, to an American father and a British mother. She never claimed or held U.S. citizenship. Many of her novels (such as And Then There Were None) were set in and around the location of her childhood home. Her childhood was a happy but sometimes lonely one. Christie's own mother, Clara, (Clara Miller) was fascinated with the occult and often told her daughter bedtime stories of mystery and adventure. She encouraged the young Agatha to write and their travels together to France and Egypt provided her first taste of foreign places. The budding writer was influenced by great literature from Emily Bronte to Lord Byron and loved the poetry of Emily Dickinson. Her older sister Madge encouraged her in the detective writing genre and challenged her to write a story in which the least suspecting character is the murderer. This would become a favorite stratagem of Christie's. She was schooled at the Miller family home, Ashfield. She loved to read and also enjoyed piano, singing, dancing and tennis. Christie had hopes of becoming an opera singer and had studied music in Paris, but she was never able to establish a professional career in music. Christie's father, Frederick Miller, died when she was 11, and as a result the family struggled for many years to retain their country estate. At the age of 24 she married Colonel Archibald Christie, an aviator in the Royal Flying Corps, on Christmas Eve in 1914 just as WWI was beginning. Her first book, The Mysterious Affair at Styles, was written in 1920 and introduced Hercule Poirot. She would write at least one book almost every year for the rest of her life. The marriage to Christie ended disastrously when her husband announced he wanted to marry a much younger woman and a mutual friend of theirs. She granted him a divorce, although reluctantly, in 1928. The couple had one daughter, Rosalind Hicks. Following her divorce, Christie entered a period of great prolificness in her writing. This was the first, but not last, time that Christie would turn to writing as a refuge from difficulty. In December 1926 she disappeared for several days, causing quite a storm in the press. Her car was found in a chalk pit. She was eventually found staying at a hotel in Harrogate, under an assumed name, where she claimed to have suffered amnesia due to a nervous breakdown. The death of her mother and her husband's confessed infidelity, all in the same year, precipitated the incident. Christie herself added to the controversy by not being very forthcoming with the press. She always had an almost reclusive relationship towards the public. Her own family, for many years, remained committed to silence about this incident in an effort to preserve her privacy. The disappearance and its aftermath led to endless speculation by the press that Christie either staged a hoax to retaliate against her philandering husband or, as was more likely the case, that she was suicidal and depressed. What is known is that the disappearance of the famous detective writer added to her mystique and increased sales of her novels. Seeking solitude and retreat from her recent divorce and the publicity which surrounded her disappearance, Agatha embarked on a solo adventure in 1928. She traveled alone on a deluxe train, the Orient Express. Her destination was Baghdad. She enjoyed her stay in Baghdad so much she returned there the following year. It was on her second trip that she met Sir Max Mallowan. In 1930, Christie married Mallowan. Her travels with him contributed background detail for several of her novels set in the Middle East. Over the decades, they would travel throughout Syria and Iraq. Mallowan working on archaeological digs and Christie writing many of her most popular mysteries. If archaelogy was Max's profession, it was now Agatha's favorite past time. The couple had many wonderful experiences together on their archaeological digs where fans would often visit to catch sight of the now famous writer. Later one of their trusted employees and a mutual friend, Barbara Parker, entered into a liaison with Max that would overshadow the rest of their married life together. Christie's marriage to Mallowan did stay intact despite his infidelity. Philosophically, Christie was to reflect on love towards the end of her life by commenting on glamor and desire, saying, "that is but the 'showy flower'. Real love is the root, out of sight and nothing much to look at, but where life really is." Christie, despite her heartaches in love, never lost her faith in God or human goodness. There is no moral confusion in her books: victims are vindicated while villains are expunged. The adulterers in Christie's novels all meet with unpleasant endings. 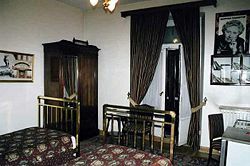 Agatha Christie's room at the Pera Palas hotel where she wrote Murder on the Orient Express. Christie's immensely popular novel, later made into a movie, Murder on the Orient Express (1934) was written in the Pera Palas hotel in Istanbul, Turkey, the southern terminus of the railroad. The hotel maintains Christie's room as a memorial to the author. Christie lamented the invention of the airplane gaining preference over what she saw as more romantic forms of travel, such as the train and steam ship. Many of her novels take place on these slower modes of travel and Christie herself enjoyed immensely the Orient Express train where she could "watch life go by." In an unusual effort to leave an inheritance for her husband and daughter, Christie put two of her manuscripts in a bank vault intending for them to be published after her death. They were to be the final cases—the great denouement—of her two stalwart detectives, Hercule Poirot and Miss Marple—respectively, in Curtain and Sleeping Murder. When she wrote the novels, intended for posthumous publication, Christie had not anticipated her own longevity. Following the success of the film version of Murder on the Orient Express in 1974, Christie authorized the release of Curtain , in which Poirot is killed off. After Miss Marple solves the mystery in Sleeping Murder, she returns home to her ordinary life in Saint Mary Mead. In an attempt to avoid further speculation and scrutiny concerning her personal life, always an anathema to Christie, she wrote her own autobiography, Agatha Christie: An Autobiography which was published in 1977. Agatha Christie died on January 12, 1976, at age 85 from natural causes, at Winterbrook House, Cholsey near Wallingford, Oxfordshire. She is buried at St. Mary's Churchyard in Cholsey, Oxon. Christie's only child, Rosalind Hicks, died on October 28, 2004, also aged 85, from natural causes. Christie's grandson, Mathew Prichard, now owns the royalties to his grandmother's works. Agatha Christie won the Commander of the Order of the British Empire decoration in 1956 for being the most popular British crime mystery writer. Her husband received the same decoration in 1960, his for archaeology. Max received a knighthood in 1968, giving them the titles of Sir Max and Lady Mallowan. Agatha received an Order of Dame Commander of the British Empire in 1971 from Queen Elizabeth II. Her play The Mousetrap holds the record for the longest run ever in London, opening at the Ambassadors Theatre on November 25, 1952, and as of 2006 is still running after more than 20,000 performances. This play was originally written as a radio play in honor of Queen Mary's birthday. It was at first titled, Three Blind Mice. Christie, obviously having fun with the nomenclature of her books and plays, often named them after British nursery rhymes. In 1955, Christie was the first recipient of the Mystery Writers of America's highest honor, the Grand Master Award, and in the same year, Witness for the Prosecution was given an Edgar Award by the MWA, for Best Play. Most of her books and short stories have been filmed, some many times over (Murder on the Orient Express, Death on the Nile, 4.50 From Paddington), and most have also been adapted for television and radio. A 1979 film, Agatha, starring Vanessa Redgrave as Christie, recounted a fictionalized version of the disappearance. 1930 Behind The Screen written together with Hugh Walpole, Dorothy L. Sayers, Anthony Berkeley, E. C. Bentley and Ronald Knox of the Detection Club. Published in 1983 in The Scoop and Behind The Screen. 1931 The Scoop written together with Dorothy L. Sayers, E. C. Bentley, Anthony Berkeley, Freeman Wills Crofts and Clemence Dane of the Detection Club. Published in 1983 in The Scoop and Behind The Screen. In 2004, the Japanese broadcasting company Nippon Housou Kyoukai(NHK) turned Poirot and Marple into animated characters in the anime series Agatha Christie's Great Detectives Poirot and Marple, introducing Mabel West (daughter of Miss Marple's mystery-writer nephew Raymond West, a canonical Christie character) and her duck Oliver as new characters. The movie Agatha (1979) is about a fictional solution to the real mystery of Agatha Christie's disappearance in 1926. Mary's Agatha Christie Blog Regularly updated news and articles from the world of Agatha Christie. This page was last modified on 8 February 2019, at 17:05.